In the mid-city region, Normal Heights is known for its affordable pubs, restaurants, coffee houses, antique shops, book shops, and burgeoning arts community. The “Normal” in the name ”Normal Heights” refers to the State Normal School, the predecessor to San Diego State University (SDSU), formerly located in nearby University Heights. The State Normal School building now serves as the Eugene Brucker Education Center, the central office for the San Diego Unified School District. Normal Heights is centrally located in the hills above Mission Valley. Its borders are defined by the 805 to the West, the 8 to the North, the 15 to the East, and El Cajon Boulevard (“The Boulevard”) to the South. The majority of neighborhood businesses are located along Adams Avenue, the main artery of Normal Heights. styles played live for free. The Adams Avenue Street Fair, SoCal’s largest free music festival, is typically held the last weekend in September. Art Around Adams is a local community art event where unique and talented artists showcase their work inside and outside interesting little businesses and spaces along Adams Avenue. The stretch of Adams Avenue between Texas Street on the west and Ohio Street on the east is sometimes referred to as Antique Row, due to the large quantity of antique stores along that stretch. 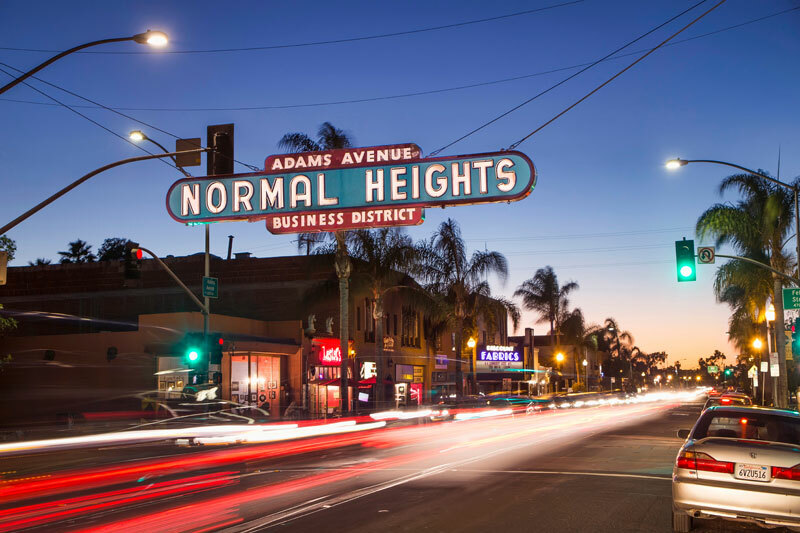 With the multitude of shops, restaurants and thriving businesses, Normal Heights is truly nestled in the center of all San Diego has to offer.